Continuity mistake: While Gatsby drives with Nick he takes his hat off and waves it, then it's back on, and then back to the previous angle of him waving it. 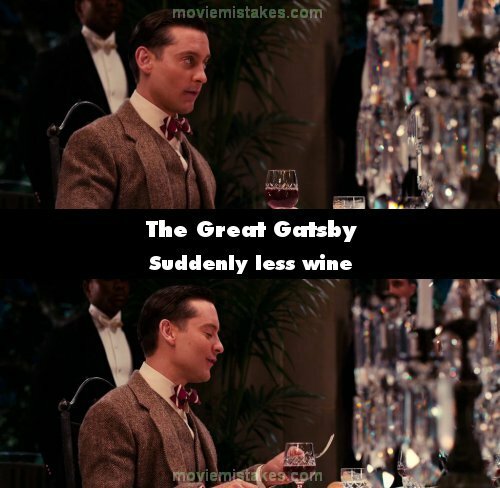 Continuity mistake: At the Plaza Hotel, Gatsby loses his temper and a strand of hair falls on his forehead. He takes both hands to button his jacket and when the angle changes his hair is brushed. His hands were too busy for him to do it between shots. Continuity mistake: Meyer meets Nick and places his hand on his shoulder. A frame later Meyer is standing sideways, several meters away from Nick. Factual error: The movie takes place in the summer of 1922. They played Rhapsody in Blue, which wasn't written till 1924. The bandleader is obviously Cab Calloway. Cab Calloway's first recordings with the Missourians weren't until 1928. "Oh! You Have No Idea" also wasn't recorded until 1928, and it was sung by Sophie Tucker, not Josephine Baker (although they do credit Ms. Tucker in the final credits). Factual error: Trains of various types appear in several shots but the trains shown - likely all CGI - are completely unlike any trains that were in use in New York in the 1920s or in any other era. They appear to be based on Australian prototypes and their design differs significantly from American trains. Continuity mistake: When Nick meets Gatsby at the party, the amount of confetti on his shoulder and hair changes between frames, sometimes appearing or disappearing on the same spot, depending on which angle is shown. Continuity mistake: When the doctor tells Nick to write the story, the pen's position differs between the close-up and wide angles from being in a 5 o'clock or 12 o'clock position. Continuity mistake: During the meal where Gatsby is about to say that he and Daisy are in love (before the trip to NY), Daisy's fringe is messed up in the wide angles, but perfectly brushed in the close ups. This changes back and forth. Audio problem: When Gatsby and Nick are in his car driving to meet Wolfshime, in wide shots you can see that what Leonardo DiCaprio is saying does not match his mouth's movements. Factual error: The "French" phone shown as they talk about the intrusive unwanted guest calling Tom wasn't invented until about the mid-30's. In 1922, you still had to hold the candlestick phone in one hand and talk into the mouthpiece while holding the earpiece up to your ear. Continuity mistake: Right before Myrtle is run over, she runs down the stairs, hair messed up. She stops for a brief second where the angle changes to a close-up, when her hair style changes completely. Continuity mistake: After Gatsby tells the story of how he met the sailor there's a blue shirt on the bed which disappears when he exits the library. Continuity mistake: While Gatsby and Nick talk when the party is over, during the "repeat the past" scene, Nick walks down the steps and a piece of fabric behind him swaps from bright red to dark brown randomly. 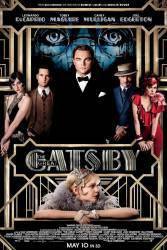 The waiter who brings Nick to Jordan's table to meet for tea after his lunch with Gatsby is the film's director, Baz Luhrmann.